The iConnect, premium Metallic Lighting Cable, and Power Bank are designed and made for the latest Apple products, not only technically but also in terms of color. PQI, the world’s leading brand in peripheral storage accessories for portable devices has introduced a sleek metallic set of accessories to match your iPhone or iPad: the iConnect, Metallic Lightning Cables and the Power Bank. All three products are made to match Apple’s devices with their sleek, metallic design and color scheme. PQI’s iConnect, Lightning Cables and Power Bank, are a collection of accessories designed from the ground up to compliment your Apple device both in function and color. The iConnect is a flash drive that acts as a simple bridge between smartphone devices and computers. The Lighting Cable is a high-grade metallic cable that syncs and charges your device and the Power Bank offers a fast and stylish way to keep your devices powered for all day use. All of these PQI accessories come in metallic color schemes to specifically match your personal style or your Apple devices. PQI’s iConnect is a USB 3.0 Apple certified Lightning connector flash drive that can smoothly transfer and store music, photos, and videos between iOS devices or be used to back up contacts. The iConnect does not need cellular data, a wireless network, or cloud access, so files can be shared safely, anytime, anywhere. The iConnect, comes in four capacities, 16GB, 32GB, 64GB and 128GB allowing users to instantly double or triple the storage space of their iPhone or iPad. For those who use their devices as multimedia players, the iConnect can be used to stream music or movies directly when plugged into an iOS device. It is also great for backing up contacts or storing confidential files with file encryption technology. Available in all three iOS metallic colors the iConnect compliments your device perfectly. Charge and sync all your Lightning connector Apple devices quickly and safely, using PQI’s MFI certified 8-pin Lightning charging cable. Plug directly into any USB port to stay connected while you’re at home, work, or on the road. The Metallic Charging Cables use premium grade aluminium connectors for ultra durability. The cables measure 100cm in length and are flat, making them tangle-resistant and they come with a Velcro strap for easy storage. The reversible USB technology allows the connector to be plugged in correctly regardless of its orientation, so you can plug it in right the first time, every time. The sleek and modern design of PQI’s Metallic Charging Cables is made to match your iPhone or iPad, with three matching metallic finishes of silver, gold and gray. Phones get faster every year, but battery life lags. If you need to keep your devices going all day, then PQI’s Power Bank is a stylish yet convenient solution to keeping your devices charged wherever you are. 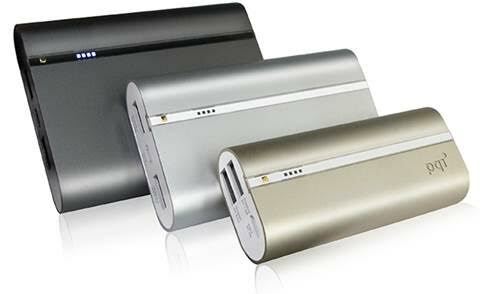 The PQI Power Bank features a sleek and elegant design that is made to match your Apple devices. The casing sports Apple’s very own MacBook grade aluminium that is not only stylish but durable with a built-in stress resistant structure. The surface has undergone anodizing and sandblasting to form a hard protective layer, making it even more wear resistant. PQI’s Power Bank is equipped with premium Samsung Li-on battery cells, which are lighter, store more energy, and retain their charge for longer. The 6000mAh PQi Power Bank holds the capacity to fully charge an iPhone 6 up to 2.4 times, yet only the size of a chocolate bar making it lightweight and easy to hold. The PQI power banks feature built-in dual USB charging ports and are equipped with dual 2.4 + 1.5A USB output ports that are controlled by an independent chip for stable, high-speed charging. Users can enjoy the convenience of charging up to 2 devices at the same time. Moreover, these power banks support pass-through charging, allowing your smartphone and tablet to be charged even when the power bank itself is in the process of being recharged. The world-class circuit design packed in the PQI Power Banks optimizes charging and improves discharging efficiency. Achieving up to 89% power conversion efficiency, the PQI Power Bank comes in three capacities: 6000mAh, 9000mAh, and 12000mAh. To further guarantee users safety, this product is insured up to $10 million USD. The iConnect, Metallic Lighting Cables and Power Banks all come in three metallic colors of gold, silver or gray to match your iPhone and iPad and the iConnect comes with a two-year limited warranty. The iConnect+ App is available on the App Store for the iPhone, iPad and iPod touch.